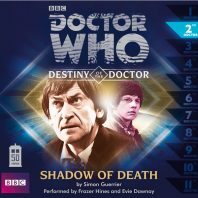 The second release of Destiny of the Doctor, ‘Shadow of Death,’ shifts from the earliest days of the First Doctor on Earth to the tail end of the Second Doctor’s era with Jamie and Zoe alongside him. Following an emergency landing on a remote world circling a pulsar with a gravitational force strong enough to warp time, the Doctor and his companions soon find that a dark and unseen force is closing in upon the human scientists studying the mysteriously empty ancient city upon the planet’s surface. The Doctor frankly describes the setting for this story as ridiculous as the best settings in Doctor Who so frequently are, and writer Simon Guerrier superbly inserts hints about the dangers surrounding this TARDIS team well before they are revealed. After quickly helping to form an alliance of convenience with the scientific expedition team that captures them, the Doctor, Jamie, and Zoe soon learn that the extreme gravity of the pulsar means that time moves much slower on this planet in general despite the base of operations operating in normal time, meaning that a few minutes spent outside if the equivalent of several weeks spent inside. With the members of the crew each taking the same number of shifts in both time zones to ensure they remain synced during what will be the equivalent of a twenty-year mission, the mystery of the Quiet Ones and their presumed attacks takes an unexpected turn when the Doctor discovers the truth and facilitates communication between the two races, the Quiet Ones coming from a race that harnessed starlight to move their great city through space before becoming trapped by the pulsar and needing to convert themselves into light and energy to prevent their inevitable extinction. Despite its relatively short running time and lack of a central villain, the latter an aspect this story shares with ‘Hunters of Earth,’ ‘Shadow of Death’ is tightly paced and makes the most of its nods to continuity and intriguing premise to deliver a satisfying tale that slots perfectly into its intended era without discussing any details about the Doctor that had not been revealed at this time in the programme’s original run. Indeed, the Doctor only casually mentions that he has a different relationship to time than most when Jamie asks why he did not die when touched by the shadow. Guerrier also manages to include a more direct inclusion of the Eleventh Doctor than the preceding serial, here as he flagrantly disregards the laws of time and sends a message on psychic paper to his earlier incarnation stating that he must save the people as well as their work for some unknown reason that will hopefully beocme clear later, in the process drawing satisfying parallels between these two distinct versions of the beloved character. Frazer Hines again gives a masterful performance as both Jamie and the Second Doctor, expertly capturing the distinct tones of each to entrench the story in a sense of reality that is bolstered further by an evocative score and sound design. Guerrier captures the characterization of all of the leads perfectly, the Doctor mischievous but determined, Jamie enthusiastic and loyal as he tries to cope with the heady ideas around him, and Zoe wholly deserving of the Doctor’s implicit trust in her as she shows off her fierce intelligence. Though the resolution is a bit rushed, ‘Shadow of Death’ is a strong, atmospheric tale that suggests the heights that this unique range that puts the Doctor more squarely into focus than The Companion Chronicles often does can reach.